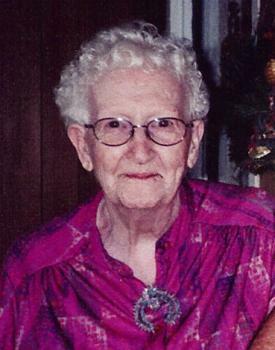 Gertrude Mabel Eastman, age 93 of Richwood, died Thursday evening, February 10, 2011 at Milcrest Nursing Center in Marysville. She was born August 28, 1917 in Lower Salem to the late Marcellus and Lavina (Schafer) Doan. She was a member of the former Central United Methodist Church in Richwood where she was active with the United Methodist Women. She was a homemaker who also did housekeeping for several local families. She was a graduate of Ridgeway High School and was always proud to say she played basketball there. In her younger years she loved going to street dances, which is where she met her husband, Leonard Eastman, whom she married on November 16, 1936 in Ridgeway. He died December 14, 1987. She was also preceded in death by an infant son and all of her five brothers and five sisters. She is survived by a niece, Evelyn (Howard) Grose, Richwood and numerous other nieces and nephews. Funeral services will be held Tuesday, February 15, 2011 at 2:00 PM in the Stofcheck-Ballinger Funeral Home, Richwood where friends may call from 12:30 to 2:00 PM. Pastor Michele Holloway will officate and burial will follow in Byhalia Cemetery. Pall bearers will be Howard Grose, Michael Grose, Ron Carpenter, Bob Hildreth and Ron Eastman. Memorial gifts may be made to REAP, 401 N. Franklin Street, Richwood, OH 43344. I'm sorry I won't be in town for the funeral. I will always remember going to visit Aunt Gerty. God bless you all. We'll always have wonderful memories of our special friend "Gertie." We always looked forward to her visits because she was part of our extended family. Although our hearts are heavy, we know she's with Leonard in Heaven. I have many fond memories of Gertie while growing up on South Franklin Street as a kid. She was such a kind, cheerful woman and so helpful to my Mom. May you rest in peace Gertie.